Home album Album Launch Blogcon Bloggers' Conference Himig Handog P-Pop Love Songs love songs Marion Aunor Marion Aunor BlogCon Rocky and Marion Aunor song Marion Aunor Narrates the Story of Feeling Inlove and Brokenhearted in Her Songs! 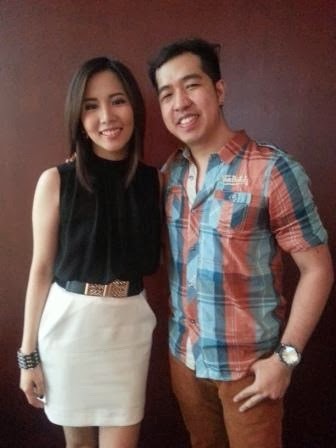 Marion Aunor Narrates the Story of Feeling Inlove and Brokenhearted in Her Songs! Love really makes every person inspire to be creative. Whenever we fall inlove, we are inspire to sing, to write a song, or even compose a poetic article to narrate the feeling we were experiencing. Or the other hand, if we are brokenhearted, we are getting emotional keeping us to write or release the feeling of bitterness in many other ways. Well in my case, I experienced those two things pertaining to love! In case of Ms. Marion Aunor, the "Himig Handog P-Pop Love Songs" third-place winner, she can write her own song both when inlove and when brokenhearted! I've asked her if what is easier for her to write a song, when inlove or when brokenhearted. Her answer was both! That's why in her self-titled album, two songs there pertained to the opposite feelings of love. Her carrier single called "If You Ever Changed Your Mind" which paved way for her to win in the competition is all about heartaches for the brokenhearted persons. On the other hand, her song "Take a Chance" tells the story of falling inlove! She gave samples by singing these songs during her bloggers conference in ABS-CBN's ELJCC building. Yes, Marion sings very well! "Ang lamig at ang ganda ng boses." Her voice is really perfect in any occasion. And good to know that she's already the newest addition to the Star Magic family! "I'm happy that I get to work with artists from Star Magic. I'm looking forward to be doing concerts with them too," the singer expressed. When I asked Marion if who is her favorite international artist whom she wants to do a collaborative song with, she said Jason Mraz. And here is Marion giving us a sample of her song "Take a Chance:"
By the way, Marion Aunor is the niece of the superstar Ms. Nora Aunor. Wow, a blood of talented artist is really flowing on her! With her looks and talents, definitely Marion is a big thing in showbiz! Aside from singing, no doubt to see her soon in movies, TV series, or even in different product endorsements!